After spending the first part of this decade loosening their historic ties to the Democratic Party, Hispanic voters have reversed course in the past year, a new nationwide survey of Latinos by the Pew Hispanic Center has found. Some 57% of Hispanic registered voters now call themselves Democrats or say they lean to the Democratic Party, while just 23% align with the Republican Party – meaning there is now a 34 percentage point gap in partisan affiliation among registered Latinos. In July, 2006, the same gap was just 21 percentage points – whereas back in 1999, it had been 33 percentage points. This U-turn in Hispanic partisan allegiance trends comes at a time when the issue of illegal immigration has become an intense focus of national attention and debate – on the presidential campaign trail; in the corridors of federal, state and local governments; and on cable television and talk radio. The new survey finds that a plurality of Hispanics view the Democratic Party rather than the Republican Party as the one that shows more concern for Latinos and does a better job on the issue of illegal immigration (although a substantial minority of Latinos see no difference between the parties on these matters). Also, many more Latinos (41%) say the policies of the Bush Administration have been harmful to Latinos than say they have been helpful (16%). Hispanics are the nation’s largest and fastest growing minority group; at 46 million strong, they make up about 15% of the U.S. population. Their electoral clout continues to be undercut, however, by the fact that many are ineligible to vote, either because they are not citizens or not yet 18 years old. In 2008, Latinos will comprise about 9% of the eligible electorate nationwide. If past turnout trends persist, they will make up only about 6.5% of those who actually turn out to vote next November. But despite these modest numbers, Hispanics loom as a potential “swing vote” in next year’s presidential race. That’s because they are strategically located on the 2008 Electoral College map. Hispanics constitute a sizable share of the electorate in four of the six states that President Bush carried by margins of five percentage points or fewer in 2004 –New Mexico (where Hispanics make up 37% of state’s eligible electorate); Florida (14%); Nevada (12%) and Colorado (12%). All four are expected to be closely contested once again in 2008. By 44% to 8%, Hispanic registered voters say the Democrats rather than the Republicans are the party with more concern for Latinos. 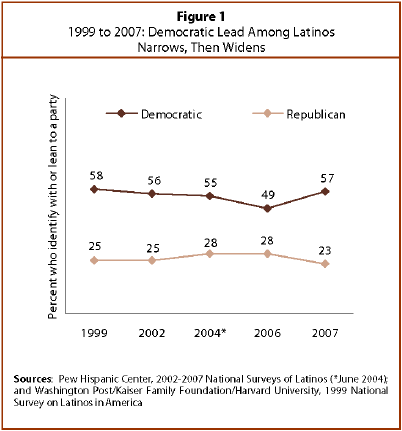 However, a large slice of Latino registered voters (41%) say there is no difference between the parties. By 41% to 14%, Hispanic registered voters say the Democrats rather than the Republicans are the party doing the better job of dealing with illegal immigration. Some 26% say neither, and 12% say they don’t know. Immigration has become a more important issue to Latinos since the last election. Some 79% of Hispanic registered voters now say it is an “extremely” or “very” important issue in the upcoming presidential race; up from 63% who said the same thing in June, 2004. Immigration still ranks behind education, health care, the economy and crime, but it is the only issue that has risen so sharply in importance since 2004. Some 41% of Latino registered voters say the policies of the Bush Administration have been harmful to Hispanics, while just 16% say they have been helpful. Another third (33%) say they have had no particular effect. Hispanics heavily favor Hillary Clinton for the Democratic Party nomination. The New York Senator is supported by 59% of Latinos who are registered voters and align with the Democratic Party. Illinois Sen. Barack Obama draws 15%; New Mexico Gov. Bill Richardson draws 8% and former North Carolina Sen. John Edwards 4%. On the Republican side, former New York Mayor Rudy Giuliani is supported by 35% of Latino registered voters who align with the GOP, followed by former Sen. Fred Thompson of Tennessee with 13%; Sen. John McCain (R-Ariz.) with 10%; and former Massachusetts Gov. Mitt Romney with 4%. The survey was conducted by telephone from Oct 3 through Nov 9, 2007 among a randomly selected, nationally representative sample of 2,003 Hispanics, of whom 843 are registered voters. The margin of error for the full sample is plus or minus 2.7 percentage points; for registered voters it is plus or minus 4.0 percentage points. For a full description of the survey methodology, see page 33. Polling results on Hispanic political views are based on Hispanic registered citizens in the 2007 National Survey of Latinos. The survey was conducted among a nationally representative sample of 2,003 Hispanic adults from Oct 3 to Nov 9, 2007. The state-by-state electoral analysis uses demographic data and official vote counts to assess the importance of the Latino electorate.